Pregnancy can leave you vulnerable to many health problems, including gestational diabetes. Dr. Gopika Gangupantula offers customized measures to manage this kind of diabetes to produce the best outcome for both you and your baby. Her expertise and training allow her to accurately assess your personal needs and assign the proper measures to optimize your health, whether it be medications, nutrition, or both. Schedule an appointment at her practice, Valley Diabetes & Obesity, located in Modesto, California. Gestational diabetes is diabetes that develops during pregnancy (gestation). Like the other types, gestational diabetes causes high blood sugar that affects your pregnancy and your baby’s health. 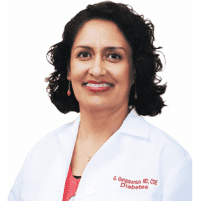 With Dr. Gangupantula’s recommendations and maintaining a healthy daily routine, it can be managed, and your blood sugar can return to normal soon after delivery. What are symptoms of gestational diabetes? Gestational diabetes normally doesn’t have any symptoms. Seek health care from Dr. Gangupantula early, as part of your prenatal care so that she can assess your risk. It’s unclear exactly what causes gestational diabetes in some women. It’s speculated to involve pregnancy’s effect on your body’s glucose processing. Your high hormone levels can counteract the insulin process in your cells and raise your blood sugar. Gestational diabetes typically develops during the second half of your pregnancy. What are risk factors for gestational diabetes? Dr. Gangupantula is available for consultation if you think you may be at risk of developing gestational diabetes. What are possible complications from developing gestational diabetes? Throughout treatment, Dr. Gangupantula accommodates to your health conditions to produce the best outcome for both you and your baby. What are treatment measures for gestational diabetes? It’s crucial to monitor your blood sugar if you’re affected by gestational diabetes. Even after you give birth and your condition subsides, having had gestational diabetes leaves you at risk of developing type 2 diabetes later in life. It is highly recommended you continue monitoring your blood sugar levels post-pregnancy to reduce that chance. In addition to a healthy diet and exercise regimen, Dr. Gangupantula can provide further plans for managing your condition after assessing your case. She may offer certain medications or a nutrition plan to foster the best outcome for you and your baby.